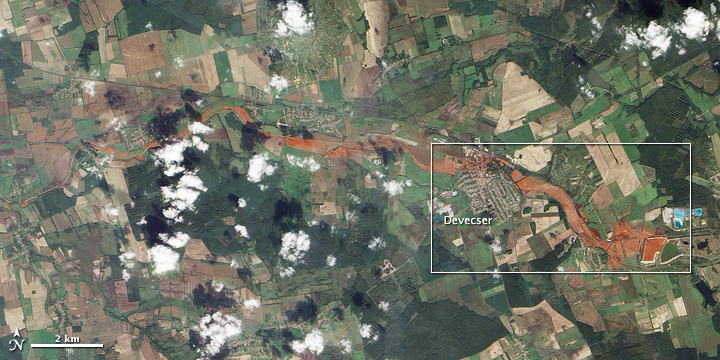 NASA Earth Observatory-On October 4, 2010, an accident occurred at the Ajkai Timföldgyár alumina (aluminum oxide) plant in western Hungary. A corner wall of a waste-retaining pond broke, releasing a torrent of toxic red sludge down a local stream. Several nearby towns were inundated, including Kolontar and Devecser, where the sludge was 2 meters (6.5 feet) deep in places. Four people were killed immediately, likely from drowning, and several more were missing. Dozens of residents were hospitalized for chemical burns. On October 9, 2010, the Advanced Land Imager (ALI) on NASA’s Earth Observing-1 (EO-1) satellite captured this natural-color image of the area. The top image shows a close-up of the alumina plant and closest villages. The bottom image shows the wider region. The alumina plant appears along the right edge of both images, and incorporates both bright blue and brick red reservoirs. The breach of the retaining wall is apparent in the close-up view. 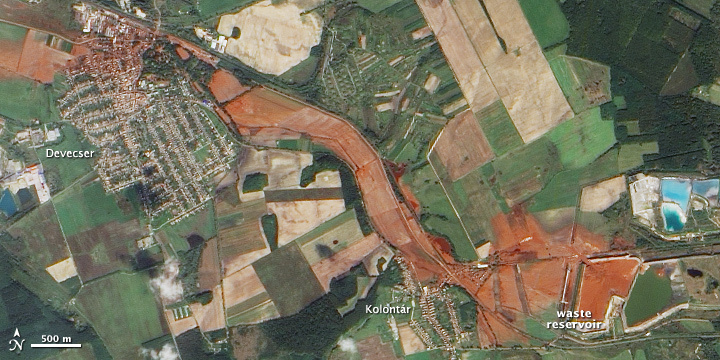 Sludge cut a channel through the northwest corner of the waste reservoir and spread onto nearby fields. The sludge forms a red-orange streak running west from the plant. The wide-area view shows the spill thinning but remaining discernible for several kilometers to the west. The New York Times reported that the stream nearest the plant empties into larger rivers. The BBC reported that authorities were pouring plaster into the Marcal River in hopes of preventing the sludge from reaching the Danube River. In the short term, the sludge swept away cars, filled homes, swamped agricultural fields, damaged bridges, and forced hundreds to evacuate. 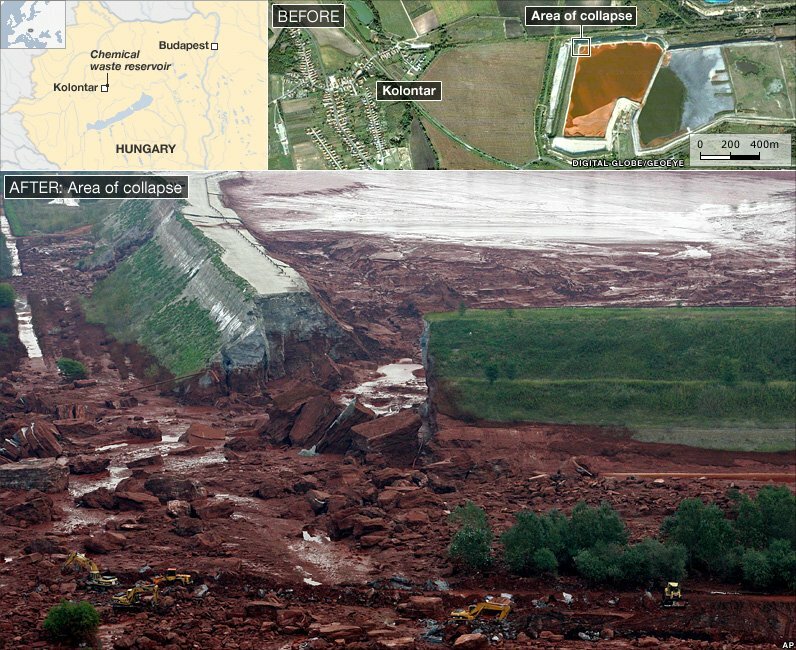 It cascaded through dozens of villages in Hungary .Dozens of homes in the western village of Kolontar, the closest to the plant, were made uninhabitable by the sludge. The red sludge is a byproduct of refining bauxite into alumina, which is used in the manufacture of aluminum and other products. About 40%-45% of the waste is iron-oxide, which gives it the red color. Another 10%-15% is aluminium oxide, a further 10%-15% silicon oxide and there are smaller quantities of calcium oxide, titanium dioxide and sodium oxide, according to MAL Hungarian Aluminium, the company that owns the Ajkai plant. It could be compared to products you would clean your kitchen with, causing dry or cracked skin, or - in cases of prolonged contact - it can "lift off the top layer of your skin". Scores of people have already suffered burns in affected areas, with at least 120 receiving treatment. If you get it in your eyes it is also not good news,. Experts say the effects are only more serious if the substance is ingested, when it can cause damage to lungs and the digestive system, and could prove fatal in some cases.